Wow. This biblical ideal wife can do everything, it seems! She gardens, cooks, sews clothing for her family and drapes for her home. She helps the needy and is an entrepreneur and she does it all while looking amazing. It’s easy to read this scripture and feel overwhelmed or defeated. I mean, HOW in the world can you do all of that with pets, work, kids and their activities and a needy husband? You may dismiss it altogether thinking that being a Proverbs 31 woman just isn’t feasible in today’s society. Well, dear friend, I’m here to tell you that you CAN live a Proverbs 31 life and it is what God wants from us as his daughters. Granted, we don’t have to plant our own fields (hey, we have grocery stores now) or sew your own clothes (hello? Macy’s! ), but you can live a godly life pleasing to Him, in the image of the Proverbs 31 woman, in 2018. Now, there’s nothing wrong with planting a garden or sewing your own clothes. I have a huge garden that we enjoy the fruits of every year, but that’s really not what this is all about. 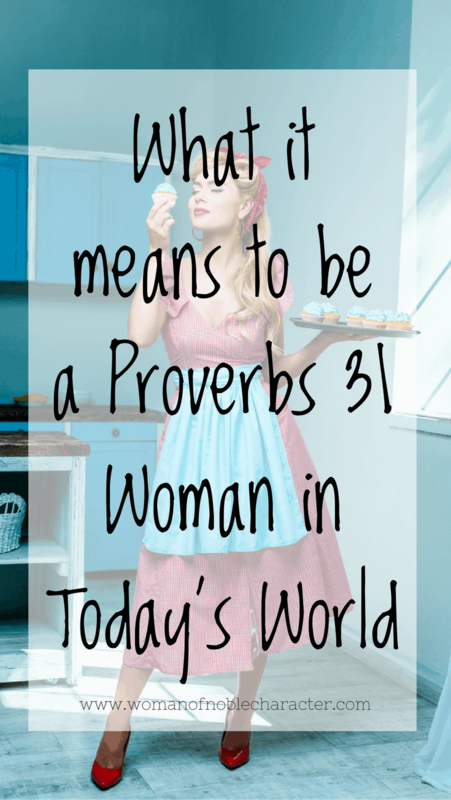 You may be wondering what IS a Proverbs 31 woman? Being a Proverbs 31 godly woman is about living a life that is one of ministry. 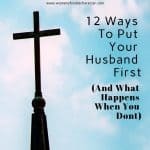 It is putting God first and your husband second and everything, yes, even your children, after that. 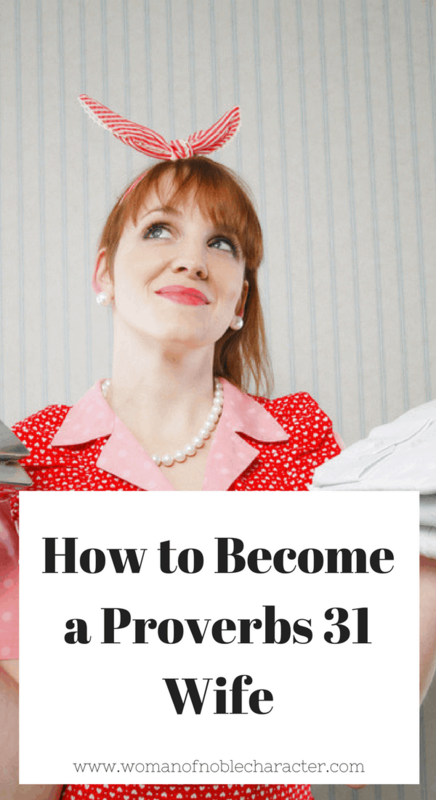 Living as a Proverbs 31 woman is about being industrious instead of idle. The woman of noble character serves her husband, her family and her community. It’s not about having a perfectly spotless home or wearing the latest fashions. Again, there is nothing wrong with those things, but it is a matter of putting your priorities in order. The original Hebrew word for virtuous is Chayil (khah’ – yil). It means a force, an army, strength, able, substance, worthy, capable, strong, valiant. Woah? What? I’m supposed to be strong and valiant, too? Yes, dear one, and you already are. God created you that way. A wife who is virtuous is able to take care of her home, is worthy, strong, serves and loves her husband, is capable and industrious. Most notably, a virtuous wife is what her husband (not any other husband, but HER husband) needs. God created woman to be man’s helper. .
What the ideal woman is for YOUR husband is as unique as he is; Above all, the specifics of how to be a suitable helper to your husband are unique to him and your marriage, the concept is the same – a wife of noble character is her husband’s crown. Learning your husband’s love languages and serving him through those love languages is a great way to ensure that you are the Proverbs 31 wife that YOUR husband needs. My husband’s love languages includes gifts and acts of service. This isn’t saying that the only way to make him happy is to buy stuff for him. I’ll pick up his favorite snack at the grocery store or leave him a love note. Your husband may respond to words of affirmation or physical touch. The key is learning what your husband needs from his wife; this Proverbs 31 woman in his life. We were created to be his helpmeet. What does your husband need in a modern Proverbs 31 woman? Have you asked him? I encourage you to pray about this and see what God reveals to you. Certainly, ask your husband what he needs from you. You may learn that what you thought was important to him isn’t and that there are other things that he would rather you do. Husband’s are funny creatures. When I asked my husband this question, he told me how much he appreciates my making his homemade sweet tea. He says that it shows how much I care for him. Really? Who knew that something so small (in my eyes) touched him so much! What makes your husband unique? How can you be a crown to him and not decay in his bones? What are three things that you know your husband would appreciate you doing that you don’t already do or don’t do very often? If you aren’t sure, spend some time this week asking God to reveal this to you. or my book, The Complete Proverbs 31 Wife: A Verse by Verse Exploration of What it Means to Be a Proverbs 31 Woman in Today’s World. Or check out a different perspective from Mary at Healthy Christian Home. Bible Gateway also has a great commentary on a wife of noble character. You may wish to check it out. One of my greatest finds, however, is the Ultimate Bundles Productivity Bundle! It has amazing resources for Christian women to get more out of their days and weeks such as: Beyond Blessed Life Planner for Christian Women by Ana Willis and Driven Women Grace Based Productivity for Christians by Phylicia Masonheimer. These two fantastic resources are worth the cost of the whole bundle! Did you ever wonder why the Proverbs 31 woman get a bad rep? Read about it here. I agree! We can be the Proverbs 31 woman. Women make great entrepreneurs. Women who are single can look for a man that is respected like hers is. Married women can have a husband who sings her praises like this man does. Families can raise their children to respect and love their moms like this woman’s. This is one of my favorite teachings from the Bible. You made Proverbs 31 looks feasible. I always ignored this text as I thought, where in the would I began to become ONE, it’s doable and I was quite harsh to myself to think I don’t even meet 1 tick of this chapter but now I learn that I meet 2-3 of this. I will strive for excellence with God’s help. Amen! That’s great to hear. Thank you for stopping by! This post is written so beautifully and is so helpful for women aspiring to live up to the Proverbs 31 standard. Thank you for this! Oh thank you so much sweet sister! That made my day. Thank you for stopping by! I do admire the practicality with the modern day relevance. I’ve always viewed this as an impossible feat for any woman, especially about she cooks and sews for her maids and household; does all this homemade stuff; being an entrepreneur and gardener. I mean, most of us are struggling financially and to think of having it down pat like that, seemed aloof. I now understand that it is impossible to be ALL of these things, but actually suggestions that we could apply where possible. Pleasing God and lifting up our mates spiritually and every ‘’ALLY’’, being role models, great patterns to our household and respective communities, is what Proverbs 31 is all about. God bless you tremendously for this post. I’m so glad that you have stopped by to share. Each Proverbs 31 woman is unique to her husband. We often forget that. God bless you! Wow! Thank you so much for writing this. I have always felt discouraged when reading about the Proverbs 31 women because she seems perfect and something that is not attainable for us to be like. I am pleased to have read this and see it discussed in this light showing us ladies how to make it happen. I’m so happy to hear that. 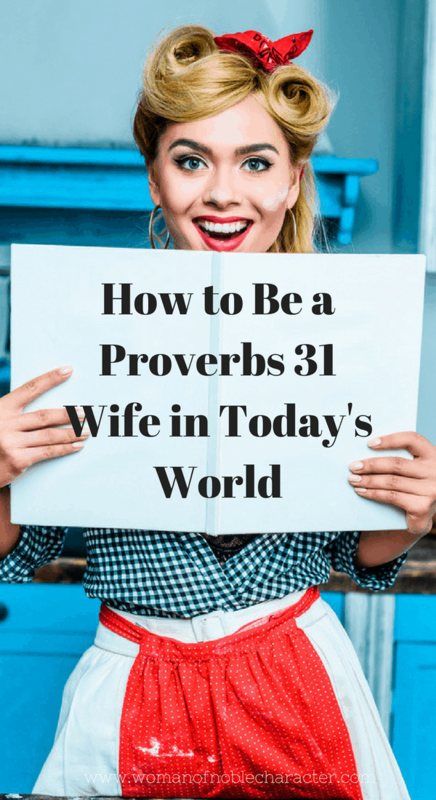 The Proverbs 31 wife in unique to her husband – your marriage, your husband, your Proverbs 31 life! 🙂 Thanks for stopping by! Hi, Anthony – thank you for writing. I write about this topic in my new book, The God Centered Marriage. Friendships can encroach on a marriage in an unhealthy way. I would start by praying, then talking with her about your feelings. If you want to take a look at the book (which covers friendship, family, money, intimacy and more, you can find it on Amazon here: https://amzn.to/2yD7xPU I will keep you, your wife and your marriage in my prayers! Thanks for sharing this, I love proverbs 31, and I want to follow that standards, I always feel I am not perfect as a wife, I repent every time I can, because I am worried I make something wrong and I dissapoint God. Hello, Diana! Of course, I will pray for you. None of us are perfect, but we were created exactly the way God wanted us to be and a Proverbs 31 wife is unique to her husband. It’s not a list to check off. Talk to your husband about his expectations and priorities. You may find that they are not as high as you thought. I am praying for you, sister! Thank you for stopping by! For as long as I can remember, I have wanted to be a Proverbs 31 woman but I’ve wanted God to just transform me and make it easy, instead of me putting in the effort. Thanks for your help in seeing practical ways to make it happen in my home and for my husband. It also helped me come to grips with the impossible standards when I focused on verse 30 “…but a woman who reverently and worshipfully fears the LORD, she shall be praised.” The secret of a Proverbs 31 woman is her spiritual and practical devotion to God that permeates every area and relationship of her life. This is what is the true foundation for a life which honors God and is valued by our husbands as “far above rubies or pearls”. Yes, friend! The key is to love and fear the Lord and to remember that each wife is unique to her husband and what a Proverbs 31 wife looks like will vary from marriage to marriage. Thanks so much for stopping by! 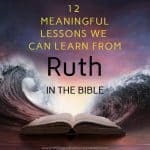 Thanks for this.i was actually looking for a resource on Ruth nd Naomi for my Sunday school when I came across this. God bless you richly. I’m so glad that you enjoyed it! May God bless you. Thank you for stopping by!